Mitchell has been working at the AUT Millennium as a Swim Teacher since February. 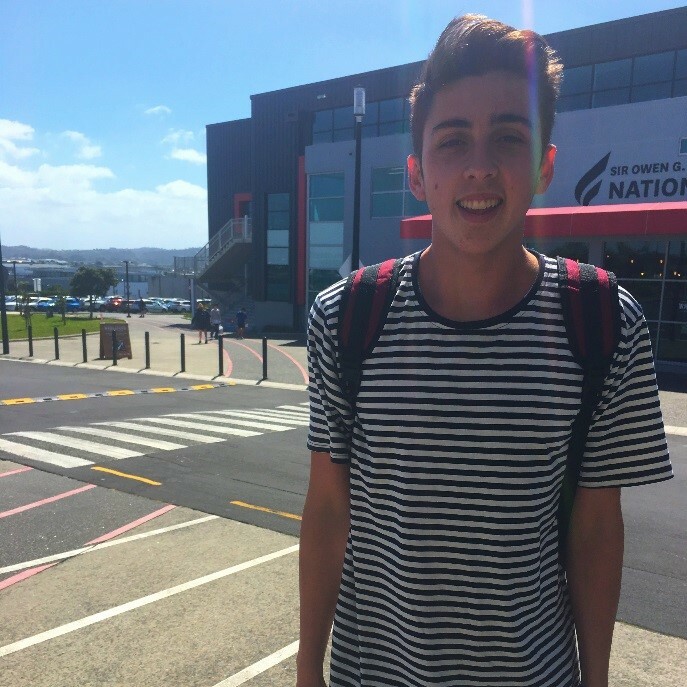 He currently attends Rangitoto College and has been playing Water Polo from a very young age. If he’s not in the pool, you can find him at the beach enjoying the surf. What is your favourite part about working at the AUT Millennium? I really enjoy watching the kids improve and become confident in the water. As someone who very much enjoyed the water from a young age, I hope this will lead kids into trying loads of water activities safely. I belong to a water polo family and have enjoyed playing the sport from a very young age. I also have a sister and dad whom have both worked at the AUT Millennium prior to my employment as a swim teacher. What song best describes you as a person? People eating with their mouths open and then attempting to talk. As a genuine and polite person. I always intend to leave a good impression on people I come across, especially the kids I teach. Do you have any “Life Pro Tips”? Something that has always stuck with me as a life tip would be “when there is a will there is a way”. Never dwell too much on the reasons why you either mentally or physically can’t do something. The only person that stands in your way is yourself. My greatest influence is my dad. He’s achieved so much throughout his life and yet he always has time for the occasional chat and good advice which I very much appreciate. If you could choose anyone dead or alive, who would you choose as your mentor in life? I don’t want to keep naming people in my family, but I would say my mother and sister have both been very positive mentors in my life. I look up to them and learn a lot from their advice and experiences. I would like to think that most of my time would be spent traveling all over the world and constantly meeting new people and experiencing different cultures. My dream Job growing up was to be an archaeologist. When I personally think of a perfect day, it’s normally just out with friends on a road trip or just having a good catch up. I think being a jack of many trades has it perks. But being a master of one, in my opinion sort of emphasises that I’ve put a lot of hard work into that specific skill and have become the best at it. Drive in Movie Theatres and marbles. Next articleKnee injuries – The statistics and 3 tips to avoid becoming one of them!